Our clients, a professional couple with small children and adorable fur babies, needed a slippery situation remedied as fast as possible. 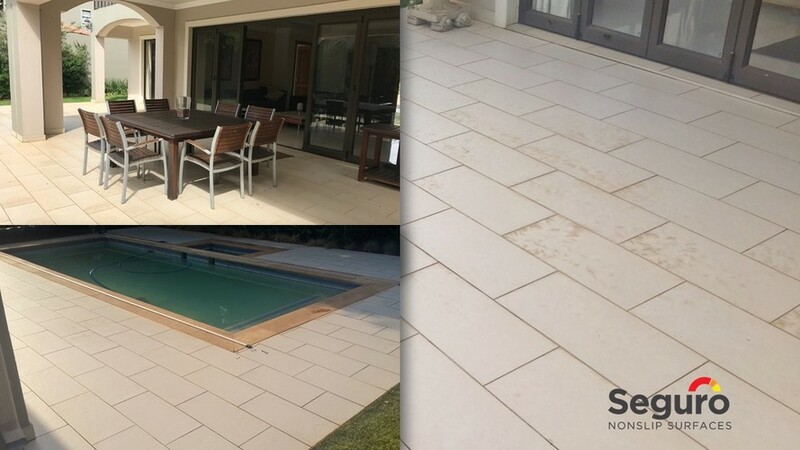 They recently moved into their new home in Bedfordview and found the tiles on the outdoor entertainment area and around the pool dangerously slippery for their family and pets. Our anti-slip coating was the perfect solution, treating the problem without changing the look of the design. The quick application time meant that the little boys could jump in the pool and enjoy themselves as soon as we were done. Seguro Nonslip Surfaces prides itself on using only the best products available when treating your slippery problem areas. Our anti-slip coating is environmentally friendly and carries a 3 year guarantee.